Here's the setup for this dumb tale of woe and wasted cash. Keep in mind, there's no blame here. No one's mad. It's just a mildly amusing story of thing we did when I was in Seattle. Fallout: Lonestar is a lofty goal. My assumption was that if I was willing to work on a large-scale mod to build practical game development skills, there should easily be hundreds of people in the world who would do the same. While upwards of thirty to forty people would aid the project, a core team proved difficult to assemble. Like the Avengers, but where no one paid them, they weren't rich, and the bulk of avenging happened on Skype. I, annoyingly, brought up the idea to every person I knew. Anyone who was familiar with Fallout thought it was great idea. Professional slab of handsome, Chris Avellone (Fallout 2, Fallout: New Vegas) vouched for us on social media, which was enormously helpful, but as time passed, the obvious stability issues that came with a bunch of unpaid modders, some of us unemployed, became a roadblock. Many people were interested, and dozens of people did help, but we needed people who could help build the game. By 2015, I’d met my development partner Max Supler while working QA on Guild Wars 2: Heart of Thorns. Instantly loving the idea, he joined the team and we became fast friends. Once the game had launched, we quit QA to focus on the mod. The hope was that we could produce something that would be impressive enough to land professional work. A completely reasonable plan, but the mod was just too damn big. We set to scaling it down to the primary city of Graveyard, which worked. We had a playground big enough to impress, but feasible for a handful of people. But two still wasn’t a handful. We needed one or two more people who, like us, could dedicate concentrated time to the project. We had credibility, and fans who wanted us to see it through, but we needed help. Contacting Bethesda had been suggested from the very beginning, way back in the New Vegas days, but I never agreed to it because we didn’t have anything to show. It was all preproduction and potential. Now we had a city. Fleshed out, cluttered, ready for development. I figured, why the hell not? A letter wouldn’t do. No one at Bethesda was going to read a letter from some lunatic group of wannabe developers. So, the following wisdom that had seen us this far, directed us blindly on. The words of a cartoon alcoholic robot steeling our resolve, we hatched a plan. Maybe “hatched” is too sinister. More like we sat around, got frustrated, had beer or two, and eventually figured it out. I’d been lugging around this crate a friend of mine gave me years ago. I never used it for anything more than junk, but I thought it looked cool, though apparently not cool enough to ever take it out of the closet. I’d been a game journalist for years and I’d gotten my fair share of promotional material. 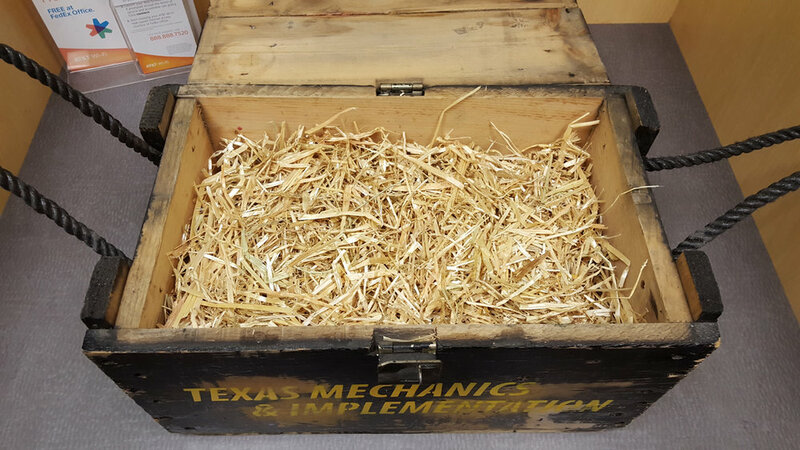 Our idea was to fill the crate with similar promotional material and then style it like a crate from Texas Mechanics & Implementation, an in-game corporation responsible for building the quarantine wall on the Mexico border (this was way before Trump, when it was more satire than a sad reflection of current policy). We thought the idea was cute, and it honestly was. The only thing we wanted was general assistance from Bethesda. Nothing specific. Anything Bethesda was willing to do would be more than what we had. Even a letter saying “Neat idea! Good luck!” would be something we could email out to the group for a morale boost. Max, an accomplished street artist, tagged the box with TMI logos and lettering to make it look more industrial. The finishing touch: The logo of our mod group, the Terrorweed, sprayed on the bottom in lonestar blue. So beautiful. So elegant. So skittery. What went into the box is where half of more-of-my-money-than-I-care-to-mention was spent. The rest of my more-of-my-money-than-I-care-to-mention was spent shipping the damn thing. Went to FedEx, got packing hay everywhere, stood in line, paid too much to make sure it got there, then mailed it directly to Todd Howard, because... I don't know, who else would care? If I had just mailed it to the studio, who knows what would have happened to it? Who knows what would happen to it? Apparently, no one. Whoever S. Simms is, they were the last person to see it. I knew then as I know now (more so as a professional) that development eats all of your time. I expected to hear either nothing or for it to show up back on my doorstep. I half-expected to get a call from Homeland Security about the "mystery crate" I mailed Todd Howard. Then something happened I didn't expect. I'm now in Boulder, CO working on Life is Strange and I get a text from Max. While it might look like a homeless college student being taken in by a generous professor, that's actually my beloved dev partner Max Supler standing next to also-beloved former Senior Designer for Bethesda (Fallout, Skyrim, now at Ubisoft, the monster. Love you Joel!) and you'll never guess what he said! Unless you guessed he said he knew f&#@-all about this crate, becuase then you guessed right! Probably because you've been paying attention. Max said Joel was really nice and that he really wanted to help us find the crate. God knows what degrading things Max had to do to get him to say that, but it was all for naught. It's nearly October 2017 now and we've heard jack in regards to the "fate of the crate". Now Joel's at Ubisoft, so there's basically no chance of him sneaking back into the Bethesda office one night to root around Todd's massive pile of unrequited love letters. Unless you do want to do that. Joel? One more mission and then you're out for good? No? Fine. I expected to hear nothing, but I didn't expect it to vanish. So if you see this crate, tell it we miss it and that it cost way too much. Then let me know where it is and I can pay for someone to return it so I can put it back in the closet.